London has long been a city which has welcomed people from across the world including political refugees and the protests that I photograph here reflect conflicts from around the world, at the current time particularly the events in the Middle East. It was of course our geopolitical meddling in the era of the British Empire that played a large part in setting up most of these continuing problems, and more recently as poodle to the spectacularly incompetent USA in bringing some of the pots to boil. Along of course with some help from the other Western nations, including Germany, France and Russia, all fighting for a share of the spoils. Back in the past it was a very profitable business – as the huge late Victorian and Edwardian banks and offices in most of our cities provide solid evidence of the success of our exploitation. We picked winners and losers; drew straight lines on maps and generally supported despots, overlooking their crimes. 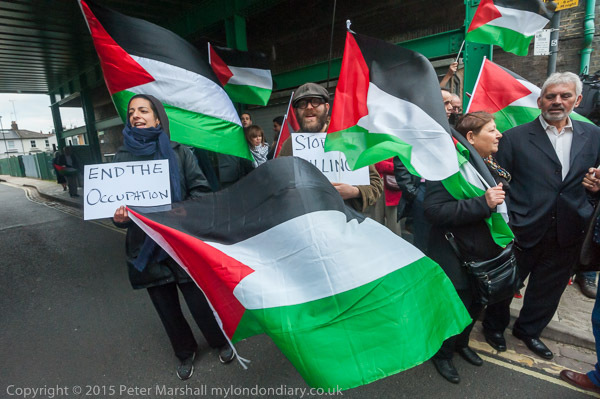 Among the losers were the Palestinians and the Kurds, and in October both were out protesting on the streets of London. 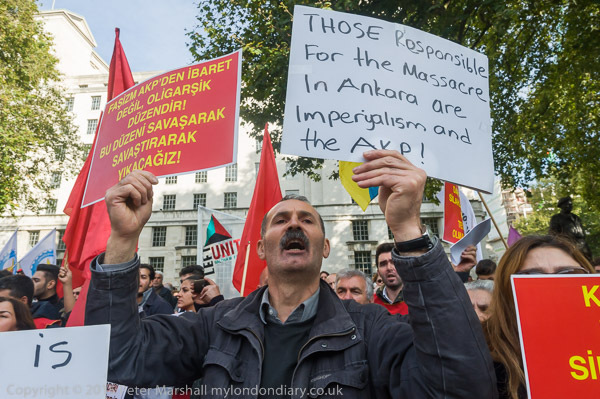 Kurds were protesting against the bombing of a peace protest in Ankara which killed 130 people, mainly young activists, blaming Turkey and President Erdogan for the massacre. Kurds living in Turkey have long been a persecuted minority, with persistent government attempts to eradicate their culture and language. Many of them want their own nation, Kurdistan, which would also include Kurdish areas of Syria and Iraq, and back the PKK and its leader Abdullah Ocalan, held in a Turkish jail for since his arrest with the help of the CIA in 1999. In recent years the Kurds have been trying to make peace with Turkey, but since Erdogan and his AKP party did well in last year’s elections, they have been clamping down on all opposition in the country. 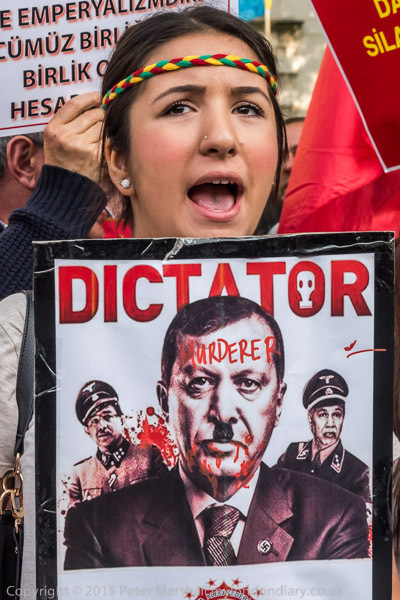 The protesters describe Erdogan as a fascist dictator. The protest received support from a wide range of groups, including some from the British left. More at Ankara peace protest bombing. A couple of days later I was outside the Palestinian Authority UK Mission in Hammersmith where the Zionist Federation had come to stage a protest against the stabbings of Jews in Israel and groups supporting Palestinian resistance to Israeli occupation and terror had come for a counter-protest condemning all violence in the country. Police kept the two groups over a hundred yards apart, though just within sight of each other. More pictures of both at Zionists and Palestinian protests over killings. Loud public address systems meant they could at least hear some of what the others were saying. But it was clear that those supporting Israel were deaf to what the Palestinian supporters were saying, with Professor Manuel Hassassian, Palestinian ambassador to the UK quite clearly condemning the violence on both sides and down the road a speaker making as his main point the ‘fact’ that the Palestinians refused to condemn violence against Jews. 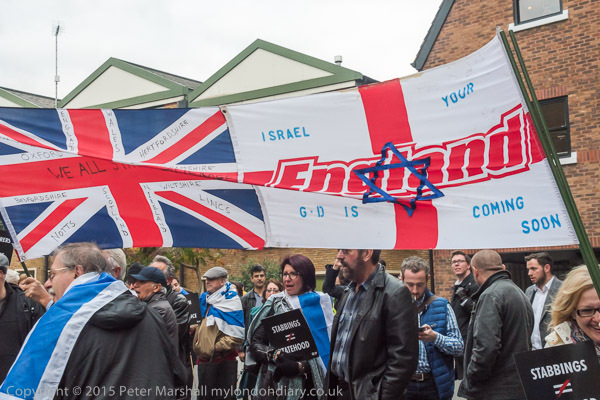 Both groups of protesters were predominantly Jewish, and the pro-Palestinian protest had been called by Jews for Boycotting Israeli Goods along with other Jewish groups, while some extremist right-wing Christians had come to support the ZF. From Hammersmith where the stand-off was continuing, I took the tube to Westminster, for Citizens UK Vigil for more Refugees , a candlelit vigil at Parliament calling for 1000 Syrian refugees to be resettled in the UK before Christmas and 10,000 a year for the next 5 years. The vigil was in Old Palace Yard opposite the Houses of Parliament, and I often find it just a little frustrating that it is almost impossible to see that most obvious and iconic symbol of Parliament, the clock tower of Big Ben from that location. But working in the middle of the crowd I did manage to have it just visible, floodlit at top centre of the image above. I made the image by available light – almost entirely from the candles. 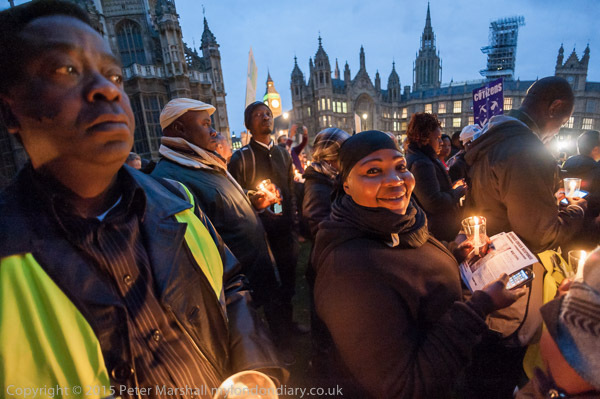 Parts of the protest were lit up by powerful floodlights for video, but these created problems for me with a very different colour temperature to candlelight. Using the D700 at ISO 3200 and 1/40s f2.8 with the 16mm Nikon fisheye gave a rather underexposed result that needed some work in post-processing – along with the use of my usual plugin to ‘defish’ the image to a cylindrical perspective. The ultrawide lens is great for working inside crowds, though it was a little difficult to move around particularly with people holding lighted candles. This entry was posted on Tuesday, March 1st, 2016 at 11:06 am and is filed under My Own Work, Photo Issues, Political Issues. You can follow any responses to this entry through the RSS 2.0 feed. You can leave a response, or trackback from your own site.